About a month ago I chose my workshops. There were hundreds to choose from, and I had no idea what any of them were about. I saw one “Simplicity In The Theatre Is Very Complicated” and thought the title looked interesting. So I looked at the blurb, and saw the name Jean-Guy Lecat. That meant nothing to me. But then I saw another name – Peter Brook. I had heard of this guy, and for me that really is something. As someone who has only been in theatre for three years, I know virtually no names. 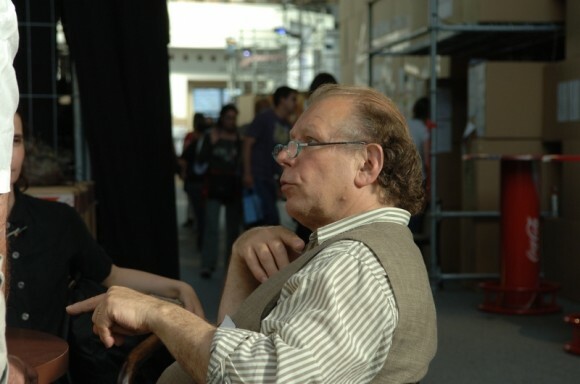 Jean-Guy Lecat was Peter Brook’s designer for many years, and many shows. Incidentally, I have also heard of Robert Wilson, William Shakespeare and Samuel Beckett. That is about the breadth of my theatrical who’s who. So anyway, I read the blurb, and it said that you had to write and perform a play in five days. I liked the sound of this. For one thing, it sounded almost impossible. And that is what attracted me to the workshop. On the first day the workshop was due to start at ten am. I arrived at 9:40am only to be told by the door attendant to come back at ten thirty. I came back at ten thirty to find nobody was there. So I waited. And waited. A few others turned up and waited with me. At eleven someone else came in and went to the back room. It turned out that workshop had been in the back room all along, and had started at ten. We were mortified. I can’t really blame the door attendant. True, he was an idiot, but so was I for taking his word. For the rest of the morning Lecat showed us a series of images designed to challenge our view of perspective. He also carried out exercises that did the same thing. For example, he showed us the fingers of God and Adam touching in the Michaelangelo painting, and then asked two participants (one of them me) to recreate the entire image with our bodies. Well, we had no idea what it was meant to look like, because even though we knew the painting, we only really knew the finger-touch part, because that is the most striking part of the piece. Several people knew how Adam was lying, but everyone believed that God was standing, but we were wrong. He is also lying down in the painting. In the afternoon we were organized into three groups. Lecat told a few stories as a starting point, and then we were asked to come up with something to be performed on the last day. In the evening we were shown a video about Peter Brook. This was a long day, but the next four days were even longer. On the morning of the second day we went to the National Theatre of Prague, and Lecat talked about the history of the theatre in relation to its style and architecture. He talked about why things were the way they were, why there were balconies (acoustic reflection), why the decoration was gold (bourgeois) and red (this is the closest colour to black in the spectrum, and fades away fast when the lights go out). This was going to be the format for the next few days. In the mornings we would visit a theatre space, and Lecat would describe its qualities, its benefits and drawbacks, in the afternoon he would give a lecture on the aesthetic and acoustic qualities of theatre spaces, and afterwards we would work on our performances. In the evenings there was a video to watch, which meant that the workshop lasted for about twelve hours a day. Many of the participants were up to the challenge. Some, however, were not, and the size of the class diminished a little each day. Our group began with eleven people. By the day of our performance we were down to seven. The ones who stayed, however, found it very hard. A twelve-hour workshop every day was a big commitment, especially since there was so much going on at the Prague Quadrennial and in Prague itself. For many of the participants it was their first time to Prague, and the distractions were endless. Even I, as professional as I always try to be, was distracted Ã¢â‚¬” on the evening of the third day I had to choose between watching the video, or going on a date with a beautiful girl. I must confess that I chose the girl. At this point I’d like to mention a little of what I picked up from the man himself, from Jean-Guy Lecat. His philosophy of design, I was startled to discover, was similar to my philosophy of writing. That is, to study up to a certain point, but after that to just do it. Sure, the first things you do will stink, but after a bit of practice you’ll get better. If you spend all your time studying the work of other people, you won’t have any time left to do your own. As Lecat said several times, you learn by your mistakes. His particular philosophy of theatre design is that a set incorporates everything in the space, from the stage to the audience to the seats on which they sit. 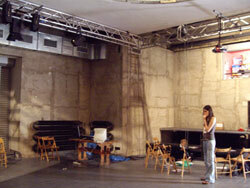 This was an eye-opener for me, since I had never thought about set design on such an all-encompassing scale before. He repeatedly ingrained in us the idea that it is all too easy to be trapped by the architecture of a place. A designer must never allow the architecture to dictate how his or her design is created, but must adapt the architecture to suit the production. He was very keen to show us that actors are extremely important in a design, and they must be comfortable in the environment you create for them. You should also not be afraid to take a risk. If you have a design that is almost complete, but it isn’t working for you, you should scrap it altogether and start on something new, rather than continuously revising the same thing. You can always come back to it later if everything else fails, but sometimes taking the risk of trying something new pays off. The performance we did was based on the story of a group of children who left home to seek adventure. We changed it later to a story about a ship sinking, the children are marooned on an island with one adult, they decide not to grow up and murder the adult. By a completely different method of adaptation we had arrived at our own version of Lord of the Flies. But we didn’t care; we were running out of time and needed something, anything. I found a piano and decided to use it, so we changed our performance to Lord of the Flies, The Musical, and we tried to inject a bit of humour into it. Another group were using the same initial story, and the third group did a story about a plastic duck that went swimming in the ocean. I was sceptical about this method of working. We had eight designers in our group, and all of us were highly opinionated and refused to compromise. We wanted to take the story in eight different directions. We also had a director in our group, but he left on the second day. I don’t think he could take any more arguments. Oddly enough, as soon as he left we all managed to come to some kind of agreement, and were then able to work in the same direction. Our performances were received well by the audience, and by Lecat’s response of “they were not too bad.” His criticism of all three groups was that we talked too much. We discussed too many things while not actually doing anything. He believed that we should have experimented more with making things, or playing with different objects, rather than simply discussing options. This ties in with his philosophy of learning by doing, and makes sense. The third group, who performed the story of the duck, was clearly better than the other two, and Lecat’s explanation was that the performance came more from their hearts and instinct than from discussion. I found out later that they had spent so much time discussing things that they ran out of time, and had to make something up on the spot. Whereas our group and the other had solidified a story quickly, and methodically worked from that. Perhaps we should have used one of Lecat’s methods, and scrapped it for something entirely new. By the end of the workshop there was not a single participant who wasn’t utterly exhausted. The five days had been intense for everyone. But working in such an environment can be extremely beneficial for those who can handle it. Many people became friends through this workshop, united by their indignation of how much was expected of them, or by their annoyance at those who left the groups, or by simply discovering that they were able to work well together if they tried. Personally I discovered that there is a way to work without a single person being in charge. I had always believed that a theatre production needed a leader to get things done, but now I wonder if that’s true. Sure, our performance was terrible, but we got it done nevertheless, and the performance was only a starting point. I want to explore this working method further. Also, I think that working like this can lead to greater spontaneity, which is important for theatre. Theatre is all about people, and it’s temporary. A performance only exists for the duration of the performance. You cannot capture a performance on video, it loses its dynamic and is boring to watch; similarly, you cannot enjoy a person’s company by watching a video of them, you have to be with them personally. I don’t know if that’s what Jean-Guy Lecat was trying to teach us in his workshop, but that’s what I got out of it. I also took to heart his philosophy of learning by making mistakes. Our group made many mistakes, and we learnt a great deal. While I certainly have no intention of making any more mistakes during my lifetime, I am confident that I will be very knowledgeable by the time I am an old man. I was accepted in this workshop, but by circumstances of life itself I couldn’t make it. I was very happy to find this personal view. I’m sure I would have like to participate in it. Thank you to sare with others your expirience. I took part in the first workshop. You have summed up the experience really well. You must have been talking about the second workshop because I did not meet you. It was pretty much the same for the first one (exhausting). It was an unforgettable experience. Especially since the room we were using got flooded one day. We had to halt the rehearsal and move the electrics but it created a really dramatic noise with the thunder which would have been useful for the effect of a storm at sea. We did the duck story you mentioned. It was great to meet other young creative people from different countries. I learned a lot and made new friends. It is a very inspiring experience for young people to do. Here’s a video of our performance I got from Mateo. We were in the third group in the first workshop. Yes it was a really good experience and we made it with our hearts!